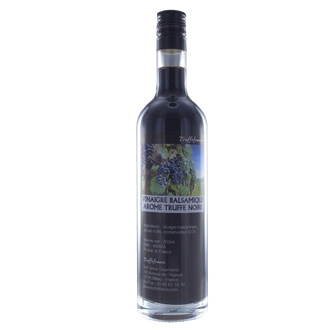 Thanks to its unique flavour, this balsamic truffle vinegar is a firm favourite with all French foodies. Use cold: with its subtle truffle aroma, the generous fragrance of this vinegar is perfect for creating highly inventive vinaigrettes. With the truffle-flavoured olive oil it enhances all your green or mixed salads, green beans, artichoke hearts, tomatoes, lentils, curly endive salads with deglazed chicken livers and gazpacho. Ideal over a salad with poached eggs served with chicken livers and gizzards. Use warm: to deglaze pan-fried red meat, scallops, fresh foie gras to which it gives a hint of sweetness. It can be used in sweet and sour marinades or simply drizzled over sautéed vegetables. Add a few spoonfuls to caramelised onions or figs to serve with white meat. Add a few drops to melted butter and pour over a filet of fish. Reduced, it takes on a syrupy consistency and can be used in drops or a ribbon to decorate your plates. Use in sweet recipes: thanks to its generous and fruity aroma it can also be used in sweet recipes. Try poaching pears, strawberries, figs, peeled orange segments in a syrup (25cl water, 250g sugar, cinnamon, lemon zest, with 10 cl vinegar added at the end of the cooking time). It also adds character to caramel drizzled warm over apple tarts, ice cream, a floating island. Ingredients: balsamic vinegar, black truffle aroma, preservative E224.